In this video, I talk about how to capitalise upon your love of being a hypnotherapist, and how to reduce exhaustion and avoid burnout. Burnout is a painful topic to write about because as hypnotherapists, we like to be upbeat and positive. Yet burnout is very real, problematic, yet avoidable with the right understanding, awareness and tools. 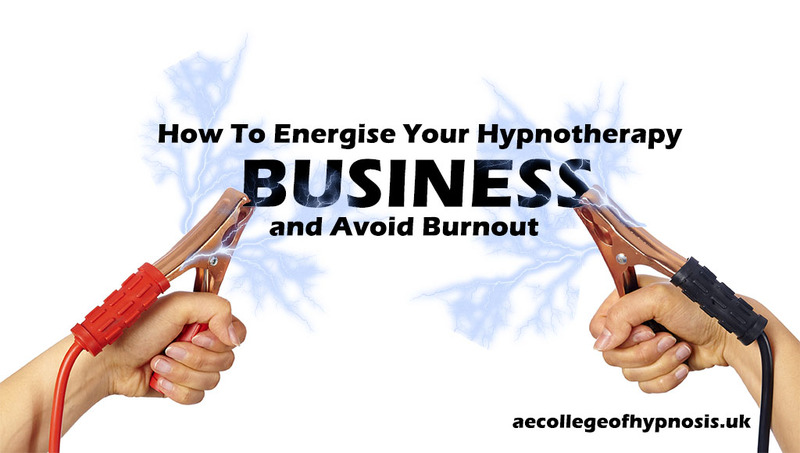 One of the things I recognise a lot with the hypnotherapists I mentor to develop their businesses, and those I supervise, is how crazy busy they are. They are often not effectively productive, but are incredibly busy, working long hours, trying to cram so much activity into their days along with seeing their clients. They are under pressure too, stressed and sometimes struggling to deal with it all and earn a healthy living. Research stresses mental health professionals must recognise that they are prone to burnout and understanding of burnout doesn’t make them immune to it. The sort of stress us therapists encounter, if it becomes excessive, is likely to create a reduction in our capacity to make decisions and think clearly, which are really important in our line of work. Despite this, mental health workers are less likely than other caring professions to seek help before it gets to the burnout phase for a variety of reasons. The aim of this video is to help with raising awareness and offering some tangible assistance. I recorded this on my way to the beach with my family and so my family dog decided to pipe up a bit as she was in the room with me waiting for me to finish!